Many authors are currently interested in Adolf Hitler’s rise to power. It is hard not to read present concerns into this revival of Nazi literature, and Cory Taylor’s How Hitler Was Made is chock full of presentism. Throughout this short text, Taylor invokes such contemporary bogeymen as “fake news” (he uses those exact words several times), political scapegoating of vulnerable populations, and media manipulation. Of course, all of these conditions were present between 1918 and 1923 in Germany when Hitler went from being an unknown soldier in a Bavarian regiment to the leader of one of the country’s most popular and radical parties. Taylor takes as his subject Hitler’s rise as the face of the radical far right in Weimar Germany. How Hitler Was Made covers fairly well-trodden ground. Taylor shows how Mein Kampf revised some of the more painful aspects of Hitler’s personal biography, especially his political neutrality during the Eisner and Soviet revolutions in Munich between 1918 and 1919. 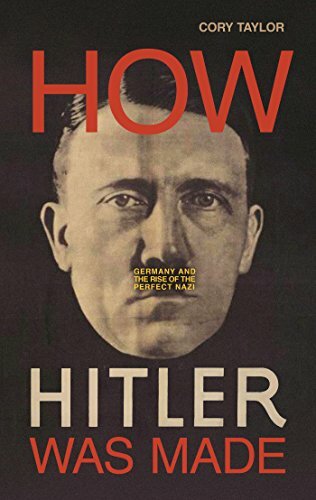 Taylor also reviews how Hitler’s ascendancy was aided by a series of short-sighted political activists, from the army intelligence officer Karl Mayr, who paid Hitler to worm his way into the small German Workers’ Party (DAP), to the Harvard-educated, German-American Ernst Hanfstaengl, who tried to convince Hitler that the future of geopolitics was in the United States. Overall, Taylor makes the patently obvious point that deep anti-democratic sentiment in the Bavarian judiciary and the German Army (Reichswehr) allowed Hitler to freely cultivate his cult of personality without serious challenges. While an engaging read, How Hitler Was Made suffers from some serious deficiencies. First, as well-researched as Taylor’s book is (the author used almost one thousand footnotes), there are times when concepts or thoughts are stated without proper context or explanation. For instance, Taylor calls the theory that Bolshevism was a “Jewish” plot an outrageous lie and a blood libel. While Taylor is right that the Nazis used this idea as part of their broader campaign to exterminate German Jewry, it is worth noting the very real fact that many Jews served as high-level officers in the Bolshevik state. Indeed, Abram Belenky and Jozef Unszlicht, two of the founding members of the dreaded Soviet secret police, the Cheka, were Jewish. This fact hardly proves the “Judeo-Bolshevist” canard (what is indisputable is that a large majority of the Soviet state apparatus was in the hands of non-Russian ethnics), but it should be noted for historical clarity. Taylor’s book also overlooks the important role that anti-communist refugees from the Soviet Union played in the formation of the Nazi worldview. While Taylor dissects the role played by Alfred Rosenberg, the Baltic German ex-pat who wrote screeds about how Jewish financiers from America had created the Jewish-led Russian Revolution, he does not mention that thousands of Baltic Germans relocated to interwar Munich and brought with them copies of The Protocols of the Elders of Zion, an anti-Semitic tract previously only common in the Russian Empire. Finally, How Hitler Was Made glosses over some of the more engaging nuances of Hitler’s early career. Besides all of the evidence that shows that Hitler was mostly likely a Social Democrat between the years of 1918 and 1919, Taylor fails to adequately examine how Hitler’s earliest expressions of anti-Semitism were connected to his strong anti-capitalism. The “25-pointe Plan,” which the Nazis unveiled in February 1920, is neither quoted nor investigated. This program, which embraced German nationalism, anti-Semitism, and a virulent strand of anti-capitalism, is a succinct crystallization of what the NSDAP looked like prior to the infamous Beer Hall Putsch. Overall, when it comes to books concerning Hitler’s earliest years as a political soldier, Thomas Weber’s Becoming Hitler is in all ways superior to Taylor’s How Hitler Was Made. Weber’s book is not only more nuanced, but it lacks the various digressions that dot Taylor’s works. Taylor also acts as a scholar-advocate for Ernst Toller, the left-wing playwright who uneasily served as an officer in the Red Army of the Munich Soviet, and Kurt Eisner, the socialist leader of the Free State of Bavaria who was assassinated by Anton Graf von Arco auf Valley. Contrasting Eisner’s humane, pacifistic liberalism with Bolshevik and far-right radicalism is understandable, but not essential. Similarly, Toller’s story in How Hitler Was Made serves no purpose other than to glorify a literary icon. How Hitler Was Made should be seen as a supplementary text, not a primary one.